You can connect up to 56 individual items to the M30, each with their own individual user recordable speech or SMS message. It also has its own integrated battery backup, Mains Failure detection and is designed for use in commercial/industrial situations. The M30 can come with backup protection for your landline so if your phone line has been tampered with or fails the M30 will automatically switch to the GSM networks to make sure you always get your alarm message. 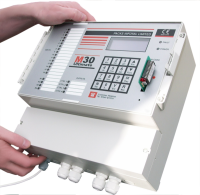 The M30 can also be used to trigger onsite audible alarms or turn on/off equipment via its remote switching capability.